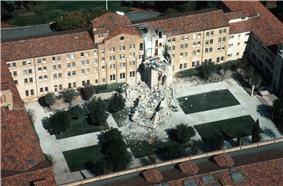 The 1989 Loma Prieta earthquake occurred in northern California on October 17 at 5:04 p.m. local time. The shock was centered in a sparsely populated area approximately 10 mi (16 km) northeast of Santa Cruz on a section of the San Andreas Fault System and was named for the nearby Loma Prieta peak in the Santa Cruz Mountains. With a maximum Modified Mercalli intensity of IX (Violent), and a moment magnitude of 6.9, the shock was responsible for 63 deaths and 3,757 injuries in the affected areas. Damage was heavy in Santa Cruz County and less so to the south in Monterey County, but effects extended well to the north (and farther from the epicenter) into the San Francisco Bay Area, both on the San Francisco Peninsula and across the bay in Oakland. The Loma Prieta (or southern Santa Cruz Mountains) segment of the San Andreas Fault System had been undergoing a long period of quiescence until several moderate foreshocks occurred in June 1988 and again in August 1989. The foreshocks were of significance because that segment of the San Andreas Fault System had been so quiet that it had been labeled a seismic gap. No large earthquake had occurred in that region since the 1906 San Francisco earthquake. No surface faulting occurred, though a large number of other ground failures and landslides occurred, especially in the Summit area of the Santa Cruz Mountains. 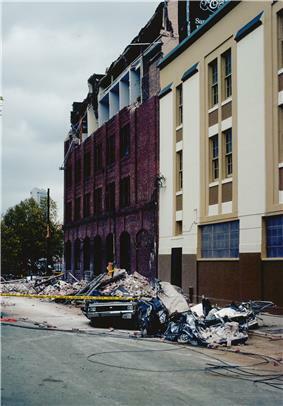 Liquefaction was also a significant issue, especially in the heavily damaged Marina District of San Francisco, but its effects were also seen in the East Bay, and near the shore of Monterey Bay, where a non-destructive tsunami was also observed. Abundant strong motion records were captured due to a large number of seismometers that were operating in the region. Due to the sports coverage of the 1989 World Series, it became the first major earthquake in the United States that was broadcast live on national television. Rush-hour traffic on the Bay Area freeways was lighter than normal due to nearly 62,000 people present at the game at Candlestick Park in San Francisco, and this may have prevented a larger loss of life, as several of the Bay Area's major transportation structures suffered catastrophic failures. 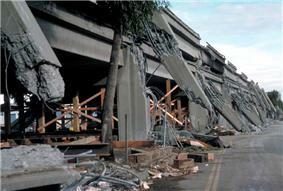 The collapse of a section of the double-deck Nimitz Freeway in Oakland was the site of the single largest number of casualties for the event, but the collapse of man-made structures and other related accidents contributed to casualties occurring in San Francisco, Los Altos, and Santa Cruz. The history of earthquake investigations in California has been largely focused on the San Andreas Fault System, due to its strong influence in the state as the boundary between the Pacific Plate and the North American Plate; it is the most studied fault on earth. Andrew Lawson, a geologist from the University of California, Berkeley, had named the fault after the San Andreas Lake (prior to the occurrence of the 1906 San Francisco earthquake) and later led an investigation into that event. For more than fifty years before the theory of plate tectonics established its motion as strike-slip, Lawson became embroiled in a controversy due to his contention that the fault was primarily of the dip-slip type. At the time of the 1906 San Francisco earthquake, the San Andreas Fault ruptured for a length of 290 mi (470 km), both to the north of San Francisco and to the south in the Santa Cruz Mountains region. Several long term forecasts for a large shock along the San Andreas Fault in that area had been made public prior to 1989 (the event and its aftershocks occurred within a recognized seismic gap) but the earthquake that transpired was not what had been anticipated. The 1989 Loma Prieta event originated on an undiscovered oblique slip reverse fault that is located adjacent to the San Andreas Fault. Since many forecasts had been presented for the region near Loma Prieta, seismologists were not taken by surprise by the October 1989 event. Between 1910 and 1989 there were 20 widely-varying forecasts that were introduced, with some that were highly specific, covering multiple aspects of an event, while others were less complete and vague. With a M6.5 event on the San Juan Bautista segment, or an M7 event on the San Francisco Peninsula segment, United States Geological Survey (USGS) seismologist Allan Lindh's 1983 forecasted rupture length of 25 miles (40 km) (starting near Pajaro Gap, and continuing to the northwest) for the San Juan Bautista segment nearly matched the actual rupture length of the 1989 event. An updated forecast was presented in 1988, at which time Lindh took the opportunity to assign a new name to the San Juan Bautista segment – the Loma Prieta segment. In early 1988, the Working Group for California Earthquake Probabilities (WGCEP) convened and made several statements regarding their forecasts for the Hayward Fault, the 360 mi (580 km) northern San Andreas Fault segment, the 56 mi (90 km) San Francisco Peninsula segment, and a 19–22 mi (31–35 km) portion of that segment which was referred to as the southern Santa Cruz Mountains segment. The thirty year probability for one or more M7 earthquakes in the study area was given as 50%, but because of a lack of information and low confidence, a 30% probability was assigned to the Southern Santa Cruz Mountains segment. Two moderate shocks, referred to as the Lake Elsman earthquakes by the USGS, occurred in the Santa Cruz Mountains region in June 1988 and again in August 1989. Following each event, the State office of Emergency Services issued (for the first time in Bay Area history) short term advisories for a possible large earthquake, which meant there was "a slightly increased likelihood of an M6.5 event on the Santa Cruz Mountains segment of the San Andreas fault". The advisories following the two Lake Elsman events were issued in part because of the statements made by WGCEP and because they were two of the three largest shocks to occur along the 1906 earthquake's rupture zone since 1914. 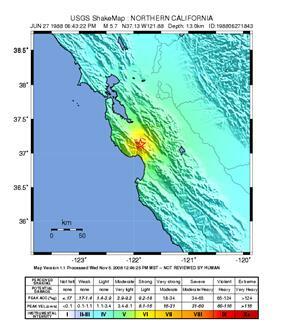 The M5.3 June 1988 and the M5.4 August 1989 events (local magnitude) also occurred on previously unknown oblique reverse faults and were within 3 mi (4.8 km) of the M6.9 Loma Prieta mainshock epicenter, near the intersection of the San Andreas and Sargent faults. Total displacement for these shocks was relatively small (approximately 4 in (100 mm) of strike-slip and substantially less reverse-slip) and although they occurred on separate faults and well before the mainshock, Perfettini et al. considered these to be foreshocks due to their location in space and time relative to the main event. Each event's aftershock sequence and impact on stress drop was closely examined, and the results of their study indicated that the shocks did have an impact on the mainshock's rupture process. Following the August 8, 1989 shock, in anticipation of an upcoming large earthquake, staff at the University of California, Santa Cruz deployed four accelerometers in the area, which were positioned at the UCSC campus, two residences in Santa Cruz, and a home in Los Gatos. Unlike other nearby (high gain) seismographs that were overwhelmed (driven off scale) by the large magnitude mainshock, the four accelerometers captured a useful record of the main event and more than half an hour of the early aftershock activity. The epicenter of the earthquake was in the Forest of Nisene Marks State Park in the Santa Cruz Mountains, approximately 2–3 miles (3–5 km) north of unincorporated Aptos and approximately 10 miles (16 km) northeast of Santa Cruz. Slip occurred along approximately 22 miles (35 km) of the fault at a depth of about 4.3–12.4 miles (7–20 km). 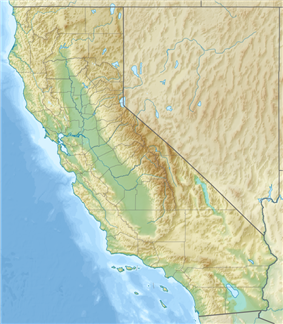 The quake was named for the nearby Loma Prieta Peak which lies 5 mi (8 km) to the northeast in Santa Clara County. Fifty-seven of the deaths were directly caused by the earthquake; six further fatalities were ruled to have been caused indirectly. 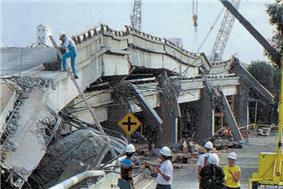 In addition, there were 3,757 injuries as a result of the earthquake, 400 of which were serious. The highest number of fatalities, 42, occurred in Oakland because of the Cypress Street Viaduct collapse on the Nimitz Freeway (Interstate 880), where the upper level of a double-deck portion of the freeway collapsed, crushing the cars on the lower deck. One 50-foot (15 m) section of the San Francisco – Oakland Bay Bridge also collapsed, leading to a single fatality, a 23-year-old woman named Anamafi Moala. Three people were killed in the collapse of buildings along the Pacific Garden Mall in Santa Cruz, and five people were killed in the collapse of a brick wall on Bluxome Street in San Francisco. ^ Times Wire Services (August 8, 1989). "1 Dead as 5.1 Quake Jolts Bay Area : Man, 19, Leaps to Death in Panic; Damage Minor". ^ a b c d USGS. , chapter 1, p. 5. "Comparison of the Bay Area Earthquakes: 1906 and 1989. "San Andreas Fault Retrieved August 31, 2009. ^ a b Gunn, 2007, p. 608. ^ Eberhart-Phillips JE, Saunders TM, Robinson AL, Hatch DL, Parrish RG (June 1994). "Profile of mortality from the 1989 Loma Prieta earthquake using coroner and medical examiner reports". Disasters 18 (2): 160–70. ^ Windmiller, Joel. "Cypress Viaduct Freeway". Retrieved August 29, 2009. ^ a b c d e f Fagan, Kevin (October 12, 1999). "Out of the Rubble. Ten Years After: First in a week-long retrospective of the Loma Prieta quake". ^ Hager, Philip (1 May 1991). "Claim Settled in the Only Quake Death, Injury on Bay Bridge". ^ a b c d Fraser-Smith, Antony C.; Bernardi, A.; McGill, P. R.; Ladd, M. E.; Helliwell, R. A.; Villard, Jr., O. G. (August 1990). 7.1 Loma Prieta Earthquake"s"Low-Frequency Magnetic Field Measurements Near the Epicenter of the M.
^ Campbell, W. H. (2009). "Natural magnetic disturbance fields, not precursors, preceding the Loma Prieta earthquake". Journal of Geophysical Research 114 (A5): A05307. ^ Thomas, J. N.; Love, J. J.; Johnston, M. J. S. (April 2009). "On the reported magnetic precursor of the 1989 Loma Prieta earthquake". Physics of the Earth and Planetary Interiors 173 (3–4): 207–215. ^ Oakland City HallWiss, Janney, Elstner Associates, Inc.
^ a b c Gathright, Alan (October 16, 2004). 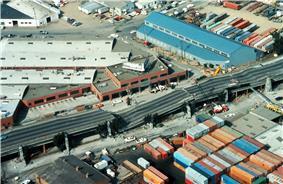 "Loma Prieta Earthquake: 15 years later. Shaken—and then stirred. Santa Cruz capitalized on fate, working together to rebuild downtown after quake". ^ "Press – Boardwalk History". Beachboardwalk.com. Archived from the original on 5 November 2011. Retrieved December 31, 2011. ^ a b c d Rapaport, Richard J. (1998). The Media: Radio, Television, and Newspapers. The Loma Prieta, California, Earthquake of October 17, 1989--Lifelines: Performance of the Built Environment. U.S. Geological Survey Professional Paper, Issue 1552. p. A43-A46. Retrieved 2013-02-28. ^ "Bay Area Television News Prepares For End Of An Era". May 12, 2008. Retrieved March 1, 2013. ^ San Francisco Earthquake History 1990–1994. Retrieved September 11, 2009. ^ a b c d San Francisco Earthquake History 1915–1989. Retrieved August 29, 2009. ^ a b Scawthorn, Eidinger, Schiff, ed. (2005). Fire Following Earthquake. Reston, VA: ASCE, NFPA. ^ a b c d Log of Emergency Response Operations. 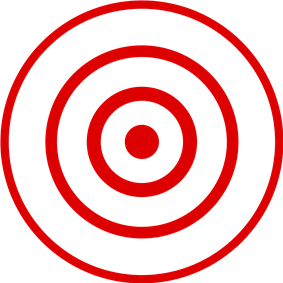 Tuesday, October 17, 5:04PM, 15-second earthquake!Santa Cruz Public Libraries. Local History. Retrieved August 29, 2009. ^ Date: October 18, 1989. Courtesy of Ray Sherrod.The front of Ford's Department Store on the corner of Pacific Avenue and Cathcart Street. A woman inside the store died from falling debris during the earthquake. Ford's was later razed.. rs009Santa Cruz Public Libraries. Local History. Photograph Collection: Retrieved August 29, 2009. ^ a b c d Overview of Fire Service Responses near the Epicenter of the Loma Prieta Earthquakesfmuseum.org. Edward J. Phipps. Retrieved August 29, 2009. ^ a b c d USGS. Historic Earthquakes. .Santa Cruz Mountains (Loma Prieta), California Retrieved September 6, 2009. ^ Cheevers, Jack (October 25, 1989). "Bay Area Quake—Landmarks Totter—Preservationists Fear Quake-Damaged Historic Buildings Will Be Torn Down". ^ The New York Times (October 20, 1989). "The California Quake: The Bay Bridge; Damage to Link Across Bay Is More Serious Than Thought". ^ Viets, Jack (October 27, 1989). "They Drove Into Gap: Survivor Recalls Death Of Sister on Bay Bridge". San Francisco Chronicle (The Chronicle Publishing Co). p. A21. ^ a b Fowler, Dave. .The Initial Response to the Cypress Freeway Disaster Retrieved September 5, 2009. ^ Fagan, Kevin (October 12, 1999). "On the Cypress Freeway, Strangers Joined Together for a Snap in Time". ^ "Man Who Lived 90 Hours In Quake Rubble Is Dead". The New York Times. ^ a b Caltrans. .1998 Highway Congestion Monitoring Report Retrieved September 20, 2009. ^ Roderick, Kevin (October 19, 1989). "Search For Bodies to Take Days—State Puts Toll at 273, Then Says It Is Uncertain". ^ a b c Stead, William G., Muni Railway Manager. "Municipal Railway Earthquake Notebook Tuesday, October 17, 1989, 5:04 PM", December 15, 1989 letter to Art Agnos, mayor. Retrieved September 5, 2009. ^ Egelko, Bob (October 18, 1989). "Earthquake leaves behind urban travel nightmares". ^ Golden Gate Bridge. .Overview of Golden Gate Bridge Seismic Retrofit Updated February 2009. Retrieved September 20, 2009. Caltrans. Richmond – San Rafael Bridge. .Retrofit Project Retrieved September 20, 2009. Caltrans. Bay Area Toll Bridges. 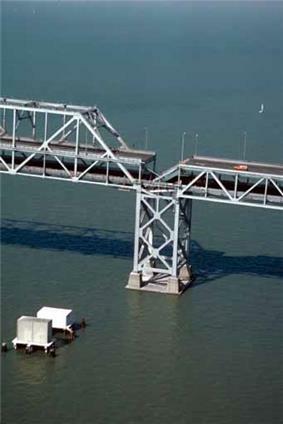 .Benicia–Martinez Bridge Seismic Retrofit Retrieved September 20, 2009. Caltrans. Bay Area Toll Bridges. .Carquinez Bridge Seismic Retrofit Retrieved September 20, 2009. Caltrans. Bay Area Toll Bridges. .San Francisco – Oakland Bay Bridge Retrofit Retrieved September 20, 2009. Caltrans. Bay Area Toll Bridges. 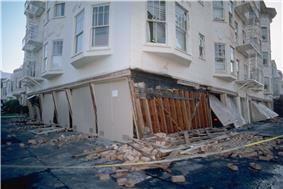 .San Mateo – Hayward seismic retrofit Retrieved September 20, 2009. Caltrans. Toll Bridge Program Oversight Committee. .Toll Bridge Seismic Retrofit Report, September 30, 2008 Retrieved September 20, 2009. ^ . August 8, 1995.Demolition Of I-280 Stub Starts Saturday: China Basin area work to last for 2 monthsSFGate.com. Retrieved October 17, 2009. ^ . December 4, 1995.Interchange Between Highway 280, 101 ReopensSFGate.com. Retrieved October 17, 2009. ^ . February 23, 1997.Major Bay Area Highway ProjectsSFGate.com. Retrieved October 17, 2009. ^ Sarah Gilbert (October 18, 2005). "Medium: Sweet Dreams". TV Squad. Retrieved April 20, 2010. ^ Todd Kennedy Hitting the American Highway: The Ontology of the Hobo-hero - 2007 "...she also utilizes Dylan's rain imagery as blinding when she says, "Oh the weather and a blinding hail / We were riding high 'til the '89 quake / Hit the Santa Cruz garden mall / Like a Wrecking Ball... p.180"
The events in the Full House episode, "Aftershocks" (December 8, 1989), took place following the Loma Prieta earthquake; it centered on Stephanie Tanner having a hard time telling her father Danny about how she fears another aftershock might happen and kill him, since he is a widowed single father, as well as other members of the family. Fringe (2008), TV show on FOX in which a character's parents were killed in the Oakland Bay Bridge collapse, while the Observer was watching her and her parents. Occurs in the episode "August". In a later episode ("Amber 31422", November 4, 2010), the alternate Walter Bishop refers to October 17, 1989, as the first time he used his amber-based protocol to heal breaches between the two universes. Grand Theft Auto: San Andreas (2004 video game by Rockstar Games) takes place in 1992, and the fictional city of San Fierro (based on San Francisco) has a few areas that have been destroyed by the earthquake that took place 3 years before the game took place. Inside Candlestick Park, fewer than half of the more than 62,000 fans had reached their seats by the time of the quake, and the load on the structure of the stadium was lower than maximum. There had also been a seismic-strengthening project previously completed on the upper deck concrete windscreen. Fans reported that the stadium moved in an articulated manner as the earthquake wave passed through it, that the light standards swayed by many feet, and that the concrete upper deck windscreen moved in a wave-like manner over a distance of several feet. Electrical power to the stadium was lost, forcing the game to be postponed. The series did not resume for 10 days. After the shaking subsided, many of the players on both teams immediately searched for and gathered family and friends from the stands before evacuating the facility. The network put up a green ABC Sports graphic as the audio was switched to a telephone link. Michaels cracked, "Well, folks, that's the greatest open in the history of television, bar none!" accompanied by the excited screams of fans who had no idea of the devastation elsewhere. ABC then switched to an episode of Roseanne which was on standby for a rain delay situation, while attempting to restore electricity to its remote equipment. With anchorman Ted Koppel in position in Washington, D.C., ABC News began continuous coverage of the quake about 5:40 p.m. (Al Michaels, in the process, became a de facto on-site reporter for ABC), at the same time as CBS News. NBC News also began continuous coverage, with Tom Brokaw, about an hour later. ABC was able to use the Goodyear blimp to capture some images of the damage to the Bay Bridge. Because it occurred minutes before the scheduled start of Game 3 of the 1989 World Series, the first moments of the earthquake were seen around the world as it happened. The World Series was being televised that year by U.S. network ABC. At the moment the quake struck, sportscaster Tim McCarver was narrating taped highlights of the previous Series game. Viewers saw the video signal begin to break up, heard McCarver repeat a sentence as the shaking distracted him, and heard McCarver's colleague Al Michaels exclaim, "I'll tell you what—we're having an earth—." At that moment, the feed from Candlestick Park was lost. State Route 1: In Watsonville, the Struve Slough Bridge collapsed, with concrete/steel support columns punching through the bridge deck like toothpicks. The highway was closed for several months until it could be demolished and rebuilt. Another section of Highway 1 through Monterey suffered damage and had to be rebuilt as well. 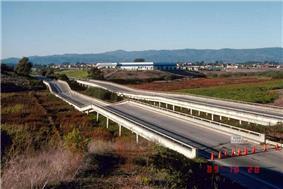 Additionally, the bridge carrying Highway 1 over the Salinas River near Fort Ord was damaged and subsequently rebuilt. Bay Area Rapid Transit: The BART rail system, which hauled commuters between the East Bay and San Francisco via the Transbay Tube, was virtually undamaged and only closed for post-earthquake inspection. With the Bay Bridge closed because of its damage, the Transbay Tube became the quickest way into San Francisco via Oakland for a month, and ridership increased in the three work weeks following the earthquake, going from 218,000 riders per average weekday to more than 330,000 post-quake, a 50 percent increase. BART instituted round-the-clock train service until December 3 when they returned to their normal schedule. Amtrak: Historic 16th Street Station in downtown Oakland suffered significant damage and was rendered structurally unsound. Amtrak would shift its Oakland operations to new station in Emeryville. Transbay Ferries: Ferry service between San Francisco and Oakland, which had ended decades before, was revived during the month-long closure of the Bay Bridge as an alternative to the overcrowded BART. A ferry terminal was put together in Alameda, and the U.S. Army Corps of Engineers dredged a suitable ferry dock at the Berkeley Marina. Additionally, the demolition of the quake-damaged Embarcadero Freeway led to the Ferry Building Terminal renovation, increasing the efficiency of ferry service to the peninsula. The passenger-only service proved popular and continues to expand its service. San Francisco – Oakland Bay Bridge, Interstate 80: The Bay Bridge was repaired and reopened to traffic in a month. However, the earthquake made it clear that the Bay Bridge, like many of California's toll bridges, required major repair or replacement for long-term viability and safety. Construction on a replacement for the eastern span began on January 29, 2002. The project was completed on September 2, 2013. Rebuilding the freeway took 11 years. In the meantime, traffic was detoured through nearby Interstate 980, causing increased congestion. Instead of rebuilding Interstate 880 over the same ground, Caltrans rerouted the freeway farther west around the outskirts of West Oakland to provide better access to the Port of Oakland and the San Francisco – Oakland Bay Bridge, and to meet community desires to keep the freeway from cutting through residential areas. Street-level Mandela Parkway now occupies the previous roadbed of the Cypress Structure. The San Francisco–Oakland Bay Bridge suffered severe damage, as a 76-by-50-foot (23 m × 15 m) section of the upper deck on the eastern cantilever side fell onto the deck below. The quake caused the Oakland side of the bridge to shift 7 in (18 cm) to the east, and caused the bolts of one section to shear off, sending the 250-short-ton (230 t) section of roadbed crashing down like a trapdoor. When that part of the bridge collapsed, one car drove into the hole, resulting in the death of the driver. Traffic on both decks came to a halt, blocked by the section of roadbed. Police began unsnarling the traffic jam, telling drivers to turn their cars around and drive back the way they had come. Eastbound drivers stuck on the lower deck between the collapse and Yerba Buena Island were routed up to the upper deck and westward back to San Francisco. A miscommunication made by emergency workers at Yerba Buena Island routed some drivers the wrong way; they were directed to the upper deck where they drove eastward toward the collapse site. One of these drivers did not see the open gap in time; the car plunged over the edge and smashed onto the collapsed roadbed. The driver Anamafi Moala died, and the passenger was seriously injured. Caltrans removed and replaced the collapsed section, and re-opened the bridge on November 18. Immediately, a number of civilians began to free victims from the rubble of Ford's Department Store and the Santa Cruz Coffee Roasting Company — both buildings had collapsed inward on customers and employees alike. Two police officers crawled through voids in the debris, found one victim alive and another dead inside the coffee house. Santa Cruz beach lifeguards assisted in moving the victims. Police dogs were brought in to help locate other victims. A woman was found dead inside Ford's. The civilians who were helpful initially, were soon viewed by police and fire officials as a hindrance to operations, with frantic coworkers and friends of a coffee house employee thought to be trapped under the rubble continuing their efforts in the dark. Police arrested those who refused to stop searching. This became a political issue in the following days. The body of a young woman coffee worker was found under a collapsed wall late the next day. The Marina district was built on a landfill made of a mixture of sand, dirt, rubble, waste and other materials containing a high percentage of groundwater. Some of the fill was rubble dumped into San Francisco Bay after the 1906 San Francisco earthquake, but most was sand and debris laid down in preparation for the 1915 Panama-Pacific International Exposition, a celebration of San Francisco's ability to rebound after its terrible catastrophe in 1906. After the Exposition, apartment buildings were erected on the landfill. 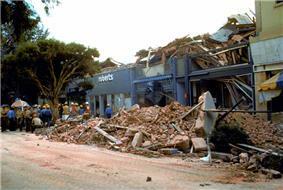 In the 1989 earthquake, the water-saturated unconsolidated mud, sand and rubble suffered liquefaction, and the earthquake's vertical shock waves rippled the ground more severely.